Hillbilly Fun Park in Fort Ann, NY has been serving up smiles since 1988. I sat down with owner Dawnn Johnston and we talked about the past, the present, and the future of the park, while a field trip of 150 kids were having a ball playing some putt-putt and devouring ice cream cones. 1. Hillbilly Fun Park opened in 1988, has a lot changed since then? Friends of ours opened the park in 1988, we took over about ten years ago, and yes, quite a bit has changed! For some reason, the kids enjoy kicking off their sneakers and golfing in the rain. We reconstructed a few of the holes so that they would drain better, allowing for people to play rain or shine. Also, there is a new Statue of Liberty coming soon, complete with torch! 2. Have you lived in the area for a long time? Mike grew up here, he went to Fort Ann Central School. I have been living here since I met him. It's been a while, but not my whole life. 3. 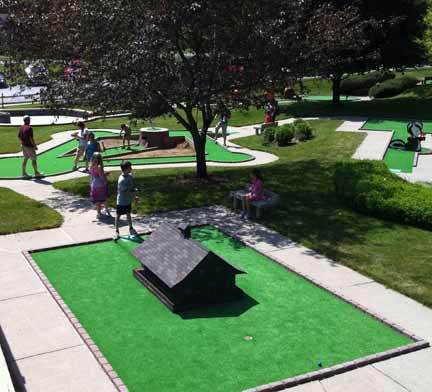 What made you want to run a mini-golf course? I have always been around kids, I used to teach special education. Mike used to teach masonry, and when we retired we needed something to do. Mikes expertise in masonry is so helpful! We renovated the park when we first took over, ten years ago. He continues to do all of the carpentry and masonry around here, and I really enjoy painting the obstacles. 4. The construction on Rt. 149 must have slowed down business for a little while, how did that go? Yes, the construction cost us our customers that were passing by and would come in to check the place out. The roadwork was detouring people directly around the park, so we weren't getting much business from people that didn't know we were here. On the other hand, the people that did know we were here continued to come have fun, even if it meant five more minutes of driving. And we are thankful for our local, loyal customers. 5. Where does the majority of your business come from? A lot of locals, and A LOT of people from Vermont. There are days when I'll walk out in the parking lot, and every car has a green plate. We love our Vermonters! 6. What do you like to do when you're not at the course? HAHA, we've been told that we should just move our beds in! Mike and I are literally here from 8am until 11pm most nights of the summer. There is very little time to do anything else! 7. It's not all about the Golf, I understand there is an Ice Cream stand and some other snacks? Yes we serve soft and hard ice cream (30+ flavors) as well as hot dogs and nachos. 8. Is there a reward for getting a hole-in-one? Yes! If you get a hole in one at the Chicken Coop, the final hole of the Hillbilly course, you win a free round of mini-golf! But beware, if you miss you might be tacking on some penalty strokes! 9. Do you do Birthday Parties and Group Packages? Yes, we have a lot of summer camps and rec. programs that come here throughout the summer. We also host birthday parties at Hillbilly Fun Park. You can decorate one of the gazebos, play golf and enjoy an ice cream party afterwards! We have even had parties get pizzas delivered here for a post-golf snack before it's time for ice cream. Groups of 10 or more are welcome! 10. What makes Hillbilly Fun Park the best mini-golf course around? We have two 18-hole golf courses that are very well maintained and feature real, concrete sculptures as well as hand-painted obstacles. You won't find your generic windmill hole at Hillbilly Fun Park.